Click these thumbnails for enlarged views of the Reflecting Absence proposal. 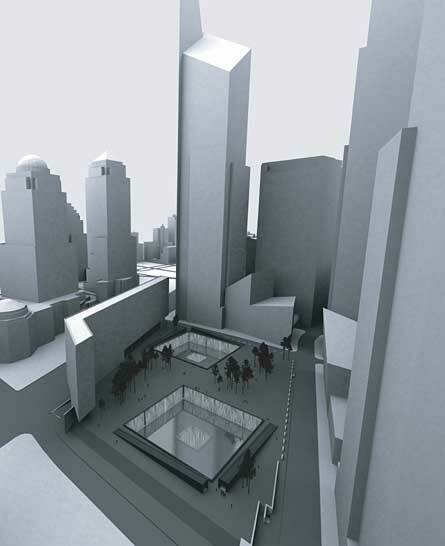 TThis design, the only one that eliminates Daniel Libeskind’s cultural center from the memorial site, centers around two pools, one for each of the fallen twin towers. Surrounding each pool is an underground space with glass walls allowing visitors to look out into the pools. Into the wall, the names of the victims are inscribed in a random order, and water falls down the glass. The center of each pool is at a separate, lower level. The two pools are connected by pathways to an underground room where visitors can light a candle. Connected to this room is a chamber where unidentified remains are buried, accessible only to the family members of the victims. Michael Arad grew up in Israel, Mexico, and the United States. He moved to New York in 1999 and works for the design department of the city’s Housing Authority. "This design proposes a space that resonates with the feelings of loss and absence that were generated by the death and destruction at the World Trade Center. A pair of reflective pools marks the location of the towers' footprints. The surface of these pools is broken by large voids. These voids can be read as containers of loss, being close-by yet inaccessible. The pools are submerged thirty feet below street level in the middle of a large open plaza. They too are large voids, open and visible reminders of the absence. The pools are fed by a constant stream of water, cascading down the walls which enclose them. Bordering each pool is a pair of sloped buildings. These buildings create a sense of enclosure, capturing the exposed outer corners of the memorial site and defining a path of circulation around each pool. They also guide visitors to the site into the memorial itself. Visitors begin their descent into the memorial by entering one of these buildings. This descent removes them from the sights and sounds of the city and immerses them in a cool darkness. As they gradually proceed, step by step, the sound of water falling grows louder, and more daylight filters in from below. At the bottom of their descent, they find themselves behind a thin curtain of water, staring out at an enormous pool that flows endlessly towards a central void that remains empty. A ribbon of names surrounds this pool and the enormity of this space and the multitude of names lining it underscore the vast scope of the tragedy that took place at this site. Standing there at the water's edge, looking at a pool of water that is flowing away into an abyss, a visitor to the site can sense that what is beyond this curtain of water and ribbon of names is inaccessible. The names of the deceased appear to be in no discernible order. The apparent randomness reflects the haphazard brutality of the deaths and allows for flexibility in the placement of names of friends and relatives in ways that permit for meaningful adjacencies; for example, siblings who perished together at the site could have their names listed side by side. Family members seeking out the name of a loved one are guided by on-site staff or a printed directory to their specific location. The location of the name marks a spot that is their own. In between the two pools is a short passageway that links them at this subterranean level. At its center is a small alcove where visitors can light a candle. Across from it, a long corridor leads to a chamber that houses unidentified remains. This space is only open to family members and serves as a private contemplative space. The end of a visit to the memorial is marked by an ascent back to street level. Visitors are again ensconced by darkness, but now the long and narrow passageway leads up towards daylight. As they emerge from the ramped enclosure, they find themselves back in the open plaza. The western edge of the plaza is bounded by a cultural building that shelters the site from the highway. The remaining three sides are open and link the plaza to adjacent streets and neighborhoods. Tall pines punctuate the plaza's surface, softening its character and creating shaded areas within this large outdoor room. Designed to be a mediating space, the plaza belongs both to the city and to the memorial. It encourages uses that are both contemplative and everyday. It is a living part of the city."